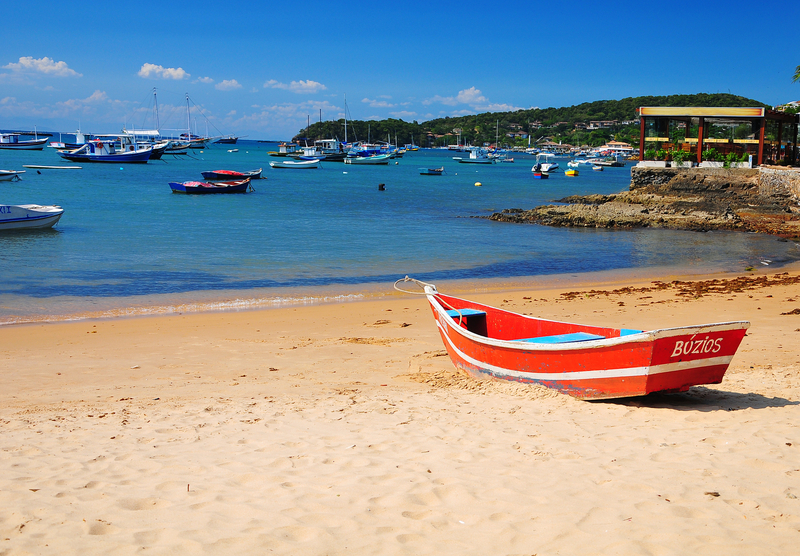 Two Hours north of Rio de Janeiro you will find the Buzios Peninsula, with over 20 breathtaking tropical beachs just waiting to be explored. Looking for sun or water sports travelers will find what they are looking for. 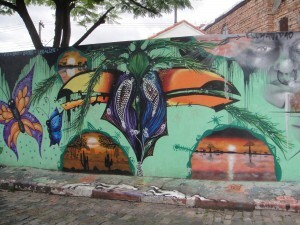 Brazils summer time from December through February and Carnival, travelers will find Buzios with a mixture of people from all over the world. You ever wake up in the morning thinking about jumping off a cliff? No I am not talking about doing something stupid, nor should I say taking one’s life. I mean don’t you have some days that you wake up, still lying there in bed, thinking, today I want to do something different, something most people would not dream about doing. Whether they just don’t think about it, or maybe they do think about it and it does not appeal to them. Fear, could be the main reason. Fear of the unknown. So on this one day a while back, I was awaken with the sun streaming thru the window, full force, since many times I don’t bother closing the curtains, my thinking is I will miss out on the day if I have the room dark and sleep late, one of the reasons I am an early riser. Early morning sunshine filling the room, laying there in bed trying to get my bearings, what day is it, where am I at. OK, I remember I am not at home, it’s coming back to me, just flew the all-nighter from Miami to Rio de Janeiro the day before, hung out most of the day yesterday by the pool sleeping and getting some rays. In between waking up, enjoying the view of the Atlantic Ocean crashing below the cliffs of the hotel, I had noticed the hang gliders coming off the mountain behind the hotels lining the beach. I think to myself, one day I would like to do that. Well, today is that day, as I lay in bed, I say to myself, what a perfect day to jump of a cliff. I need an adrenalin rush today. Head downstairs, talk to the concierge and within 10 minutes I have talked to Paulo Celani with “Just Fly” and setup a hang glider flight for later that afternoon. With an on time pickup at the hotel we made our way into and then up the mountain of Tijuca Forest National Park, largest urban rainforest located right in Rio de Janeiro. Reaching the takeoff spot, called Pedra Bonita Ramp, we were introduced to our 2 glider pilots, one for me and one for Mike my copilot, copilot being my real copilot from our flight from Miami to Rio. 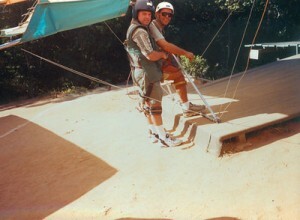 We were placed in our harness and given instructions on how we would be making the tandem flight. A couple of practice runs were done to make sure we understood. The plan was for my hang glider pilot and me would go first with Mike and his pilot to follow afterward us. A magnificent view from the ramp at 1700 feet up the mountain in Tijuca National Park, gave us a spectacular view of Sao Conrado Beach, or as the locals calls it “Pepino Beach”. About a 15 minute wait was given for the wind to pick up, enough time to get a little antsy, or really just enough time to have second thoughts about what we were ready to do. All of a sudden the Glider pilots start talking in rapid Portuguese, next thing Mike and his pilot were up and running down the ramp, so much for me going first. Next, almost as fast, we were off and running and next thing I knew we were airborne. It’s that first minute that really get the heart pumping, the adrenalin rush and then it settles in that all is fine. Gliding over the forest and then making the flight above the beach gave us some unbelievable views of Rio de Janeiro, the coast line and that of Tijuca National Park. After almost a 30 minute flight, which seemed shorter since I was enjoying it so much, we made our way to a perfect landing on Pepino Beach. From pickup at the hotel, the instruction, the flight and then the ride back to the hotel which was all included in the $160 price we spent about 3 hours doing this adventure. Well worth jumping off a cliff for. Hey, just being able to say I went Hang Gliding in Rio de Janeiro was worth it. Monday started out hot, leaving Orlando for New York I thought it was hot in Orlando until we touched down in JFK to 98 degrees. The northeast was going through a record breaking heat wave. 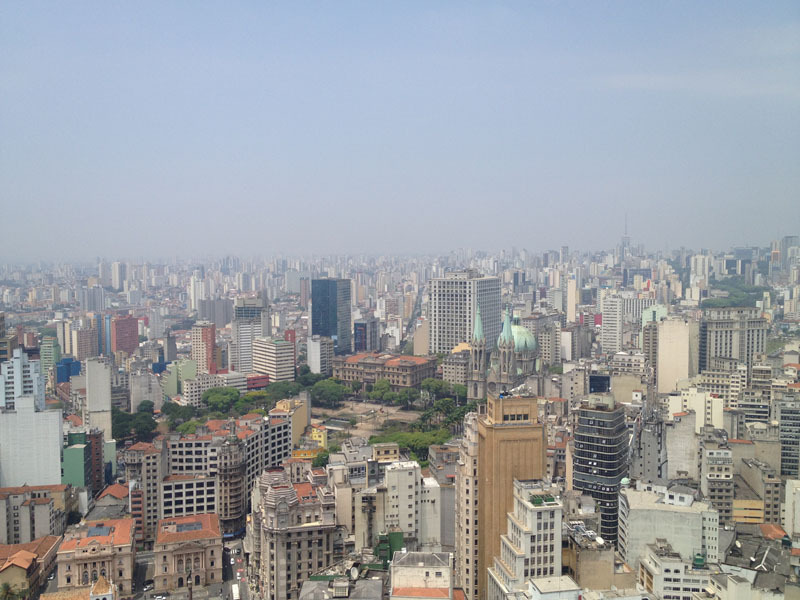 Lucky for me my time in New York was going to be short since I was headed south to South America, Sao Paulo Brazil to be exact where it is now winter. Cross the equator and the season flip from the northern seasons. Heading to Sao Paulo, and saying it is winter does not mean that I will be seeing snow or anything like that, but the weather is a nice change from muggy Florida or the heat wave that the United States northeast was going through. 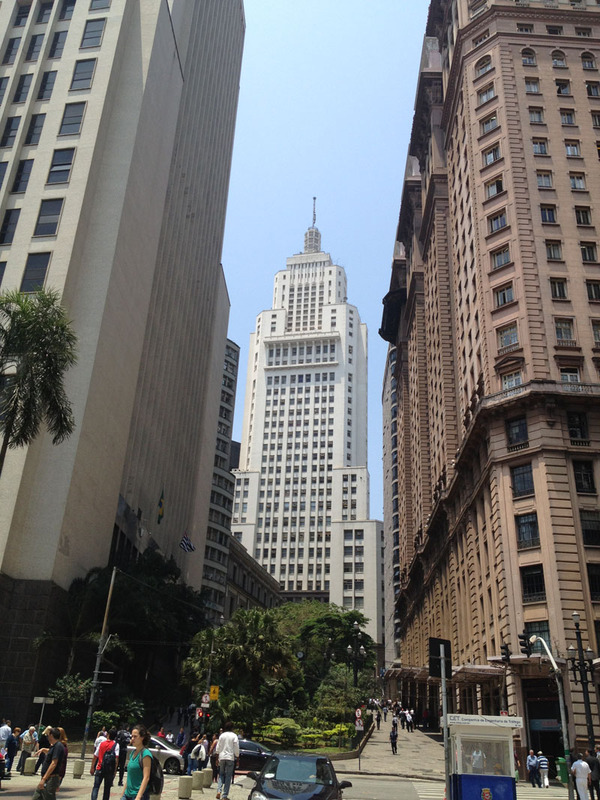 This trip we found Sao Paulo foggy when we ended up arriving early Wednesday morning, with the temperature only getting to the mid 70’s during the day, this was a perfect temperature for walking around Sao Paulo. Evening saw the temperature drop to the low 60’s to high 50’s which was just perfect for having dinner with friends at a outdoor restaurant. 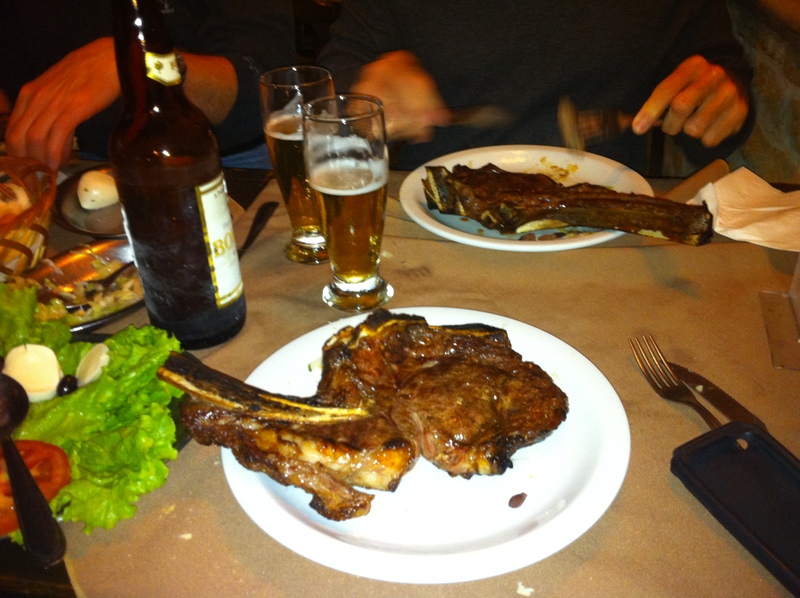 What more could you ask for, here we sat ,ate an unbelievable steak, drank and had good conversation while 3000 mile back home they were suffering in the heat. The next benefit about wintertime in South America is the flying, the weather is usually a lot calmer, fewer thunderstorms. Yes there are still the normal thunderstorms that sit year round along the equator, yet as you get farther south it is fog that is more of a problem than the thunderstorms. Headed from Sao Paulo back to New York we were routed farther east than we normally go, for the most part it is almost a straight line going from Sao Paulo to New York. This night there was a weather disturbance south of Jamaica, Dominican Republic and Puerto Rico. So we were flight planned from Sao Paulo to Belem Brazil, which is pretty much the most eastern part of Brazil then to Barbados which is almost the farthest island east in the Caribbean, from there we followed the chain of islands up over Guadeloupe and then up to Antigua before we made the turn north and headed straight for New York. 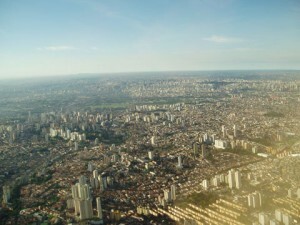 Leaving the lights of Sao Paulo behind, it is impossible to tell where this huge city starts and ends, we headed up to Brasilia. Flying over the relatively new city of Brasilia is amazing from 36 thousand feet, the city is so well laid out with straight lines and streets and boulevards making sweeping curves in tandem, Brasilia is a very neat site to see from the air. Next we headed up to Belem, sitting on the Atlantic coast and about 60 miles upriver from the mouth of the Amazon River you could make out the lights of the city giving a tracing affect of the Amazon River as it empties in to the Atlantic. Even though this was in the middle of the night you still got a impressive effect of how large the Amazon River is. Following the northeastern coast of South America and leaving Brazil then French Guiana behind it was onward to Barbados, with the lights of the island and the surrounding dark Caribbean Sea it looked like a small constellation sitting in the middle of the gigantic black universe. Approaching the island of Guadeloupe from the south, the butterfly was clearly visible, the way the island is shaped from the air it looks like a butterfly. This night again it looked spectacular in a moonless night against a dark Caribbean Sea. Leaving the lights and island of Antigua, it was a turn north into the dark waters of the Atlantic only to be broken in a couple of hours to the sunrise over the eastern Atlantic and the start of a new day. My original plan on spending my 6 hours in Rio this trip was to visit Corcovado, the famous statute overlooking the city of Rio de Janeiro. Upon arriving at the airport in Sao Paulo and getting the local weather for Rio, it was soon apparent that my chances of seeing the statue of the Christ Redeemer this trip were not looking well, Rio was calling the weather overcast skies with drizzle. Descending into Rio we broke out of the clouds at around 2000 feet, the visibility was great under the overcast skies. Off to the west we were able to see Sugar Loaf Mountain, yet looking back up the mountains it was noticeable that where Corcovado stood was well into the base of the clouds. Standing at 2300 feet, Corcovado would not be a good trip to make with the way the weather was today, oh well another trip, another day. OK how then to spend another 6 hours in Rio? I decided to spend the afternoon checking out the Governador Island “Governors Island” that Rio’s International Airport is located. Having seen the area as we have made approaches into Rio’s Galeao runway 28, I decided with the way the weather was today, overcast skies and a chance of rain, there was no sense spending the cab fare to go into the heart of Rio. Change of clothes and out to the cab stand, tried to find someone that speaks English so I could explain where I wanted to go, it was not happening, reverted to my limited Spanish once again since that is closer to Portuguese than English. Tried to explain that I wanted to be taken to a typical restaurant overlooking the water close to the airport, I even showed them on a map where I was looking to go out on the island. The driver kept telling me Copacabana, I kept telling them I did not want to go that far today, a 45 minute ride in traffic with a good chance of rain, I could not see spending the $80 round trip taxi fare today. Finally they said they understood and put me in a taxi, well off we went and very soon I realized we were not headed where I wanted to go. With help from my Google Maps on my Iphone I could tell the driver went past the road that would have taken me out into the Island. Questioning the driver in Spanish, I was told we were headed to Copacabana, no, showed him the map once again on the phone and told him I wanted the other direction. A long response in Portuguese, that I did not really understand, yet we ended up turning around. Next thing I know the driver is pulling up to this fancy restaurant, we are only about a mile from the airport, once again I tried to tell the driver this is not where I want to be , I want farther out on Governador Island, I want a typical restaurant looking overlooking the water. He’s telling me this restaurant is looking out over the water. This is not what I had envisioned. In frustration in not being able to communicate in Portuguese, I decided to get out, asked how much for the ride, was told 30 Reals, wow, almost 15 dollars just to go 1 mile from the airport, they saw gringo on this face. I paid and got out and headed out of the parking lot to the street. Spying a bus stop about 1000 feet down the road I headed that way. As I am walking the taxi driver pulls up along side of me, pointing or trying to tell me he will take me somewhere else. Not happening, you rip me off once; you won’t get me a second time. First bus comes along I jumped on, on my way; figure I will take it to where it takes me. The bus passed through the town of Portuguesa, what I would call a typical Brazilian working class neighborhood of shops, restaurants and banks. Portuguesa was nothing fancy, so I stayed on the bus which then proceeded to the far end of the island, just where I wanted to go. 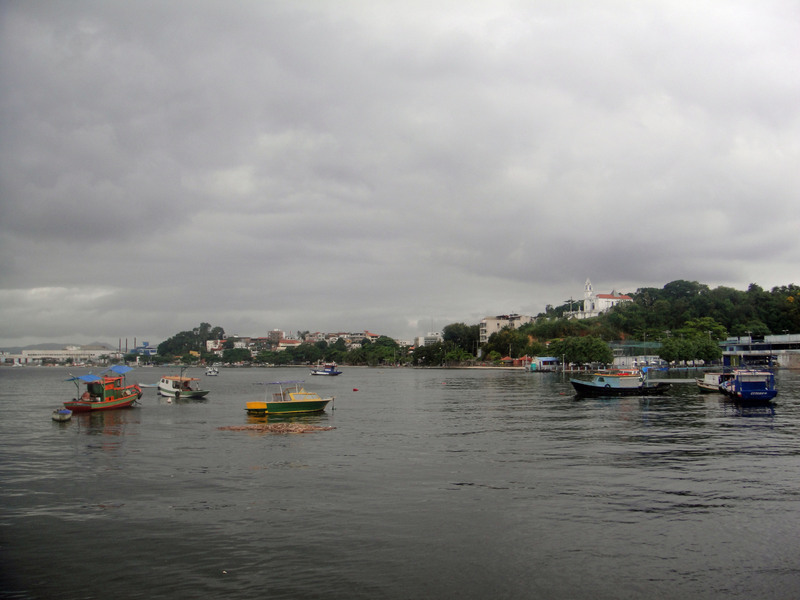 I ended up getting off at Praia da Banderia “the Beach of Flags”, located right on the Bay of Guanabara. 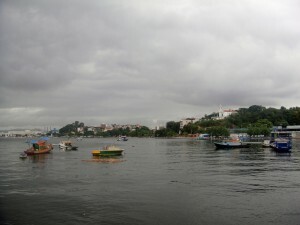 I found the water I was looking for, the small town with restaurants and shops of Paria da Banderia surrounded the main park and were bordered by the bay. 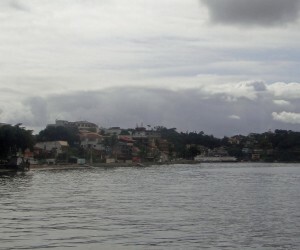 I decided to walk south along the water’s edge where there was a nice sidewalk following the contours of Guanabara Bay. The scenery was nice but I would say this was not one of Brazil’s better beaches. There was a lot of trash in the water and no sand or beach to sit. I passed quite a few drink stands as I made my way to the next little town of Ribeira, a small fishing village. 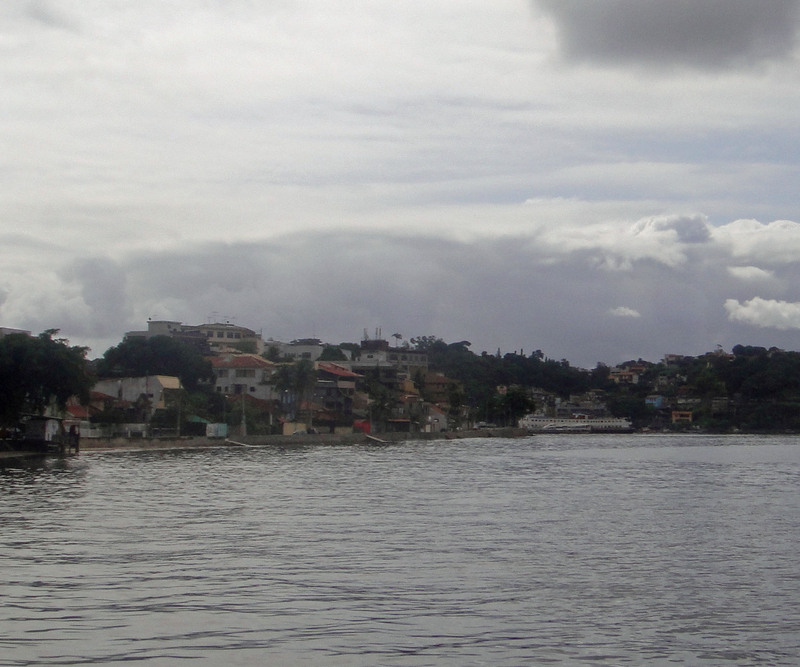 From Ribeira I walked down a tree lined neighborhood of condominiums and houses to Praia do Iequia located on a small hamlet bordering the military installation of Moro do Matoso. Again many small drink shacks lined the water’s edge, yet at this time most were closed, think it being a Wednesday and not many people around it was probably more of a weekend place. Not finding a decent place that was open to eat, I decided to catch the next bus that came by, off again back to Portuguesa for lunch. Full from a good lunch, I again caught a bus and headed back to the airport. All said and done, it was a good way to spend a couple of hours rather than sitting at the airport all day. Weather threatening yet no rain, I still think it was a good choice of not going to Corcavado. I have come to the conclusion when I get back to Orlando I will have to pull out the Rosetta Stone lessons for Portuguese. 6 Hours in Rio de Janeiro (part 2) We flew in for the day from Sao Paulo with another 6 hour layover in Rio de Janeiro. 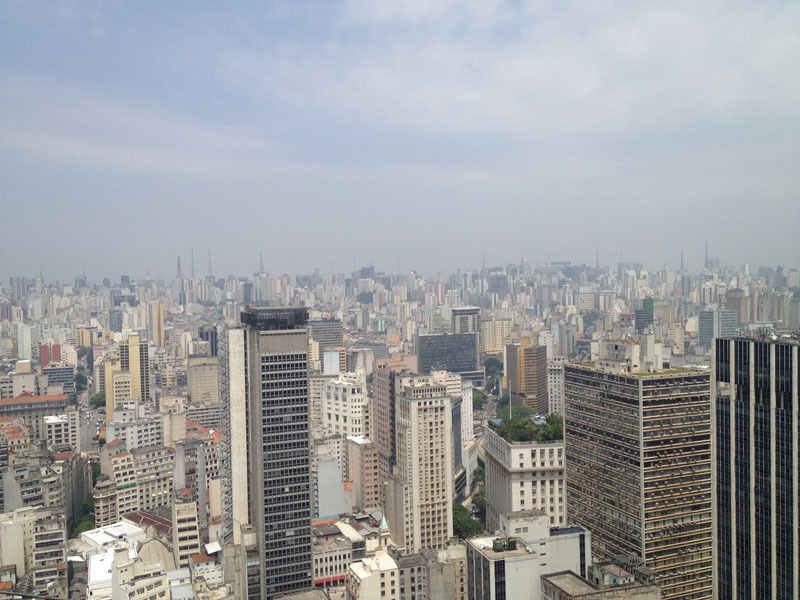 Looking to see how we could spend the afternoon in Rio, my copilot and me grabbed a taxi at the airport and headed for Sugarloaf Mountain or Pao de Acucar as the Brazilians call it. 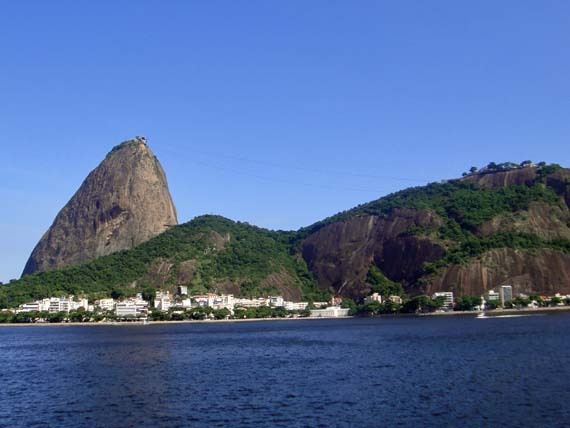 Located at the mouth of Guanabara Bay lies Sugar Loaf Mountain. Driving along the avenue flanking Botafogo Beach you are given an excellent side view of Morro da Urca, the lower mountain at 700 feet and Sugarloaf Mountain at 1300 feet. The taxi driver dropped us off at Urca where the cable car station is located to climb the mountains. Two glass enclosed cable cars carrying up to 75 passengers leave the station every 20 minutes for the 5 minute ride to the first stop at Morro da Urca. Excellent views of Sugar Loaf Mountain, Botafogo Beach as well as downtown Rio and Corcovado with the statue of Christ Redeemer can be seen from the Morro da Urca station. Next was another cable car ride to the top of Sugarloaf Mountain with unbelievable views of the entrance of Guanabara Bay and Niteroi City located on the eastern shore of the Guanabara Bay. To the north is Aeroporto Santos Dumont, with the planes today taking off headed right towards Sugarloaf before banking off to the east, to the west another great view of Corcovado and the city of Rio, coming around and looking south a great view of Copacabana. On the top of Sugarloaf mountain there were several trails wandering thru jungle like vegetation offering great viewing points around the mountain, we did see a couple of climbers finishing up a climb with ropes and repelling equipment. Both Sugarloaf and Morro da Urca had snack bars and facilities. Traveling to the top of Surgarloaf Mountain one needs to plan on a minimum of 3 hours to enjoy the views, today’s adventure took us 5 1/2 hours from Rio’s Galeao International Airport, to the top of Sugarloaf Mountain and return to the airport. Before leaving and heading out to Sugarloaf Mountain we were told it is best to see Sugarloaf first and much higher Corcovado with the statue of Christ Redeemer second so one is not disappointed by the views. We found the views from Sugarloaf were spectacular and well worth the visit.